You are here: Home / EUGlobe / Who is culpable in the EU for Ukraine’s defection to Russia? 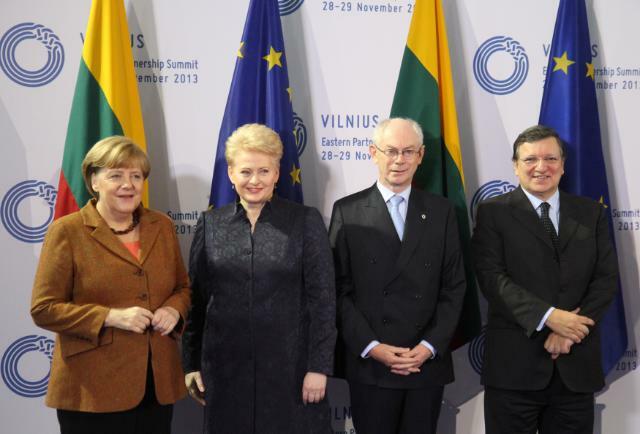 José Manuel Barroso, President of the European Commission, (on the right), Herman van Rompuy, President of the European Council (second from right), Dalia Grybauskaitė, President of Lithuania and President in office of the Council of the EU, and Angela Merkel, German Chancellor (on the left). They all participated in the 3rd Eastern Partnership Summit in Vilnius, pictured here smiling but understandably not happy. (EC Audiovisual Services 29/11/2013). The 350,000 to 500,000 people who protested yesterday, even violently at times, in the centre of the Ukrainian capital Kiev, belonged, theoretically, to the three opposition parties, which had organised the rally. Unquestionably however, all Ukrainians believe that President Viktor Yanukovich – who decided at the last minute to turn down an Association Agreement with the EU – had succumbed to Russian President Vladimir Putin’s threats and promises. It’s also true that the Ukrainian President chose instead to join the Moscow led Eurasian Union (EAU) because the democratic procedures are not at their best there, a reality that will allow him to use all the tricks he knows, to win the next election in 2015. By choosing EUA in the place of EU, he can also keep in jail the former Prime Minister Julia Tymoshenko, possibly his most important opponent in that electoral confrontation. The Brussels’ demand that Tymoshenko should be freed and allowed to travel to Germany was probably the extra condition set by the West, that made Yanucovich change sides at the very last-minute. It’s not only that though. Ukraine is a deeply divided country. The European Sting writer Suzan A. Kane stressed even since 19 November, one week ahead of Ukraine’s U-turn that the “The River Dnieper is so wide that it actually divides Ukraine not only in two distinct geographical areas, but in two widely differing parts. Even the Orthodox church of Ukraine is divided in two, the eastern part belonging to the Moscow Patriarchate and the other part to the Kyiv Patriarchate”. The majority of the inhabitants of the three eastern regions consider Moscow as their closest ally, while it’s quite the opposite for the citizens of the three western provinces. Given all that yesterday’s huge Kiev demonstration of hundreds of thousands of citizens supporting the Western option for their country and demanding the government to resign over this last-minute change of camps was quite predictable. That’s why the government had prepared a strong ‘law and order’ answer to the protesters. Extended use of tear gas and stun grenades was made by the extra security forces, which were called in by the Ministry of Interior. The largely unneeded violence used by police and other paramilitary forces evoked strong reactions all over the West. High Representative Catherine Ashton and Commissioner Štefan Füle, responsible for EU’s Eastern Partnership issued a joint statement on last night’s events in Ukraine. It went like “The European Union strongly condemns the excessive use of force last night by the police in Kyiv to disperse peaceful protesters, who over the last days in a strong and unprecedented manner have expressed their support for Ukraine’s political association and economic integration with the EU”. Minister of Foreign Affairs of Lithuania Linas Linkevičius has also expressed grave concern about the overnight events in Ukraine. Lithuania holds the EU Council Presidency during the second half of 2013. Linkevičius stressed that the “Use of force against peaceful protesters in the centre of Kiev is reprehensible. We urge the Ukrainian government to respect human rights and ensure compliance with the principles of the rule of law. We are carefully following the events in Ukraine”. Turn and twist it as the European Union may, this totally unexpected full U-turn in Yanucovich’s foreign policy options, is a major blow to Brussel’s Eastern Partnership strategy, designed to incorporate six countries (Armenia, Azerbaijan, Belarus, Georgia, Moldova and Ukraine). As it turns out, this strategy which started as an initiative of a few northern EU countries like Poland and Sweden was caught in the Brussels decision-making machine, and was drastically deformed. Understandably, the initial Eastern Partnership proposal, when it reached Brussels, was deprived of a large part of its economic and political content. As a result, it was turned down by Armenia even from last summer. Yerevan was first to join Moscow’s Eurasian Union. Kiev’s decision left the EU only with Moldova and Georgia to sign its Eastern Partnership proposal. Both of them, though, have their territories severely contested by Russia. As for Azerbaijan and Belarus, only the first one could ever contemplate to sign such an agreement with the EU. The problem is, however, if the EU would accept to cooperate closely with a regime that governs this country with an iron hand, perpetuating itself with murder and persecution against any real opposition. The Brussels bureaucracy has to be blamed for the inclusion of Azerbaijan in the EU’s Eastern Partnership strategy, giving it a character of old-time European cynicism. It is as if the EU is using whatever means to achieve its goals. In short, the EU internal decision-making machine, strongly influenced by Berlin, has to be blamed for the failure of this well conceived but ill executed Eastern Partnership strategy.